1. Do your research and read up on the latest in pool ideas and gather ideas. Once you have done that you will be ready to start planning with a pool expert. 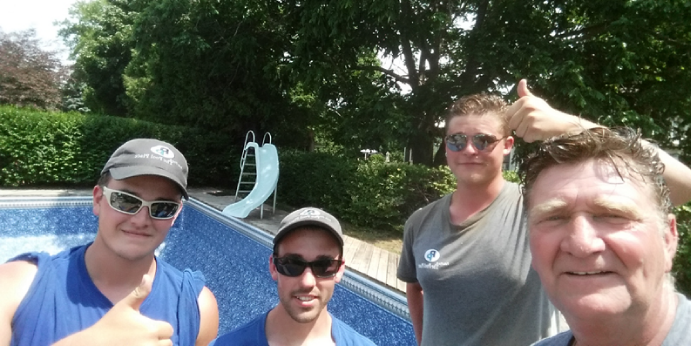 They will help you to layout your backyard oasis, recommend styles, materials to help make your pool a reality. 2. Look through magazines or photo galleries and collect images that reflect your desires. This will give your pool planner a better sense of what you would like incorporated, and helps you both stay on the same page. 3. There are many different ways of building a pool. Some are made of concrete, other of fiberglass and others vinyl. Picking the type of pool is just the first step. Learn about other steps such as coping, cleaning systems, filtering systems so that you are somewhat “in the know” when speaking to your builder. 5. Consider why you are installing the pool. Is it for you? Is it for your kids? This will help steer you in the right direction. If it is mainly for your kids – a slide or wading area might be a good idea. If you’re more interested in the visual appeal, you may consider a built in water feature. 6. Know your budget. Discuss the final costs involved. Some adjustments may be needed based on your overall budget and hire a good builder who will listen and give you suggestions. Look at their review and ask to see their past work. 7. Also consider your long term costs. The upkeep of a pool is quite affordable. Factor in the cost of water and keeping your pool full, cleaning and water maintenance and other accessories as such as pool covers, filters and even toys. 8. Choose Energy efficient items like enclosures, pool covers and pumps with timers. Ask your builder of any recommendations they may have. 9. Consider what you’d like to plant. Avoid messy trees or trees that have far-reaching shallow roots. Consider going with a bushy perennial plant that doesn’t grow tall, and can always be moved if necessary. 10. Consider your options when it comes to the finishing touches. They can range in appearance and cost, and consider the advantages and disadvantages of each material. 11. Don’t forget to include required fencing in your budget and any other safety measures you want in place. Once you’ve done your research, made your decisions and the pool construction is nearing completion, sit back and relax and dream about the day, in the not so distant future, when you fire up the grill, invite people over and break-in your pool! Give us a call - we can help you every step of the way.